Yes, they really are this anti-science. The “Stop Patriarchy” pro-abortion extremists are upset that people are seeing what Planned Parenthood is really like. It will be interesting to see what comes of this: Radical abortion anarchists plan to counter pro-life Planned Parenthood protests. In the mean time, please keep reminding people that pro-life = pro-science. Pro-life reasoning is simple and accurate: It is a scientific fact and basic common sense (what else would two human beings produce?) that a new human being is reproduced at fertilization. Seriously, go check out any mainstream embryology textbook. I’m too pro-science to be pro-choice. Based on the settled science, it is then simple moral reasoning that it is wrong to take the life of an innocent human being without proper justification, and that is what happens during 99% of abortions.e situations surrounding abortions are psychologically complex (pressures on the mother to abort, economic concerns, etc.) but morally simple (you don’t kill unwanted humans outside the womb for those reasons, so you shouldn’t kill them inside the womb for those reasons). Their size, level of development, location and degree of dependency are not reasons to ignore their right to life. 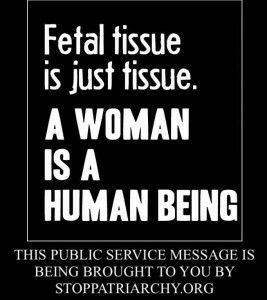 Arguments about “bodily autonomy” ignore the body destroyed in the abortion. One of the most wicked things about the “Christian” Left . . . Planned Parenthood likes to post pro-abortion views from the “Christian” Left. As awful as that is, there is an amusing benefit: Watching the pro-aborts try to dismiss pro-life religious views because they are religious yet unapologetically cheering on the pro-abortion extremists on the “Christian” Left. This post was an example: Faith leaders speak out against attacks on Planned Parenthood. One of the most wicked things about the “Christian” Left pro-abortion extremists* — aside from promoting the killing of unwanted children — is that they don’t offer the best thing about true Christianity: Grace and complete forgiveness of all your sins through faith in Jesus Christ. Anyone who has participated in the abortion process, including the mother’s parents and their boyfriends/husbands who pressure them to abort – can be forgiven of the grievous sin of abortion and all their other sins as well. But the “Christian” Left pretends that people are right with God as they are, which is an eternally wicked joke. P.S. Please spare me the hypocrisy of your religion-bashing on this comment unless you have already posted a comment dismissing the original post. After all, if you refuse to consider pro-life religious arguments you’d be a hypocrite not to treat pro-abortion “Christian” Left arguments the same way. *The “Christian” Left is far more extreme in their pro-abortion agenda than the average pro-choice person. They insist that life begins at the first breath and insist that Jesus is fine with killing unwanted children until that point. I realize how ridiculous their views sound and how many people must think I’m making a straw-man argument. But that is just because their own words are so clear and extreme: “According to the bible, a fetus is not a living person with a soul until after drawing its first breath.” More here about how to respond, with full, in-context quotes from them.